In an ironic twist, the Governors (6-0) found themselves the recipient of a win at No. 3 doubles and No. 6 singles. Last season, the Bears (3-4) were in the better position as the Govs only had five healthy players. Despite trailing 5-3 at No. 2 doubles, Lidia Yanes Garcia and Claudia Yanes Garcia combined for a clutch 6-4 win at No. 1 doubles to give the Govs a 1-0 lead. The No. 6 singles win by default meant the Govs led 2-0 before the other singles matches had even begun to serve. Claudia kept the momentum going for APSU, whitewashing her opponent in straight sets, 6-0, 6-2 to give the Govs a 3-0 advantage. However, the Bears continued to fight, taking the first sets at No. 3 and No. 4 singles. Lidia won her first set, but lost the second as she headed to a third set for the second time in three matches. Tatiana Lopez and Helena Kuppig also headed to three sets, but under different circumstances. The collegiate veterans had to win the second set in each of their matches to force a third set and each of them came up clutch. 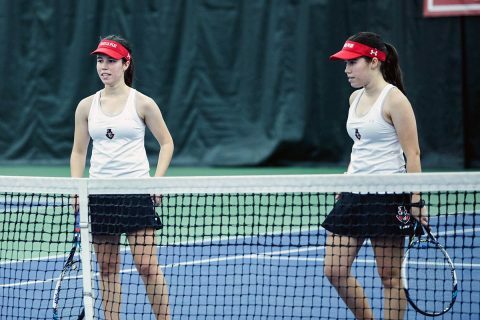 Lidia, Lopez, and Kuppig then showed why APSU tennis was picked where they were at in the Ohio Valley Conference Preseason Poll (number one, by the way), as all three players won their final sets to provide the Govs with more than enough for the victory. The Govs finish out their five-match homestand with against IUPUI, next Friday.